Last week at Studio Mothers you met Kathy Stowell, the homeschooling, simplicity parenting mother of two little ones who blogs at Bliss Beyond Naptime. I’ve so enjoyed getting to know Kathy over the interwebs and on the phone. She is truly an authentic, deeply creative soul who is dedicated to a life of simplicity, creativity, and presence. I’m always inspired by women who are so clear about the path they want to follow — and walk the talk, with all its challenges and rewards. 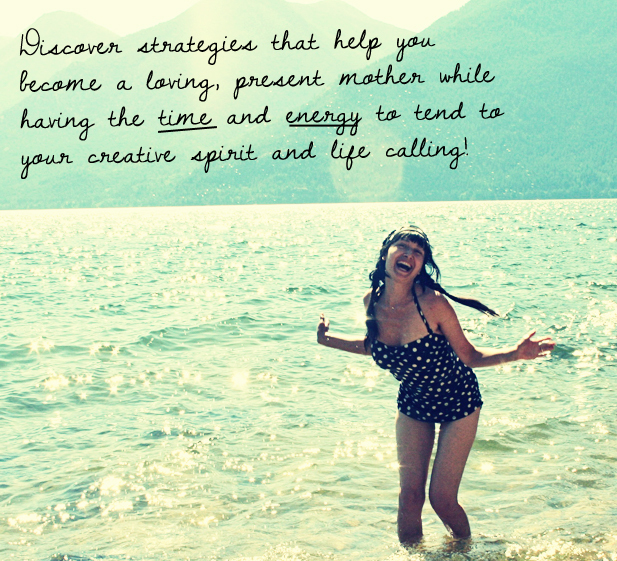 Kathy recently released the e-book and audio recording The Bliss Filled Mama: Self-Care for Soulful Mothering. I’m delighted to offer a free copy of this magical resource (e-book AND audio file) to a Studio Mothers reader! Simply leave a comment on this post and you’ll be entered to win. You have until 5:00 p.m. eastern time on Friday, February 17, 2012, to enter. If you aren’t the winner of the e-book/audio package, you can purchase it here for $14 USD. omg I’d love this! i like the fact she’s recorded it too that’s brilliant, I like hearing the truth someone has found along their pathway, nice! I loved Kathy’s post last week, as well as her blog, which I’ve added to my reading list. I welcome guidance on the path to be a “loving, present mother…tending to my creativite spirit and life’s calling” – throw my name in the hat! This sounds like an amazing book that would be so wonderful to read not only because I am one of those mothers, but also because I work with them too. I’m sure there are insights there that would help me in both areas! Thank you for the consideration! Oh, I so need to read this. It is such a delicate dance… and I welcome any and all insight. wow – sounds great! and i love the idea of a recording! Love to connect better with my Bliss Quest 🙂 and have support from my husband on it! i could really use this book! and will gladly make good use of any tips and tricks to help with this amazing roller coaster of being a mother and an artist. thanks for such a cool give-away. fingers crossed! Congratulations, Megan! You’re our lucky winner! Please send your e-mail address to creativereality (at) live (dot) com and we’ll get you hooked up! Thanks to everyone for entering–please consider getting your own copy of this resource–at $14, you’ll more than get your money’s worth!